For Mark Haggerty life has become more than a little complicated. 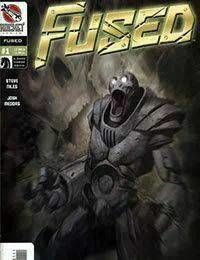 Hes been fused inside of a robotic Cy-Bot exo-suit, forced to live on a military base, and become the subject of endless tests, all the while trying to figure out how to relate to his wife from inside a hulking metal body. If that werent enough now he has to defend himself against the unwanted advances of group of superheroes who want to recruit Mark into their ranks... Its enough to give even a robot an ulcer, and judging from the mysterious ache in Marks metal stomach it may just have done that!